Are you scouting for the perfect home for a film shoot? Or, are you a homeowner who thinks your home has star quality? We recently spoke with Andrea Raisfeld, owner of Andrea Raisfeld Locations, about what makes a house a great location. Her answers may surprise you! What makes a home film/shoot worthy? AR: Good bones and good décor that’s not overly specific or over the top, and neutrality in wall color and furnishings. What makes a great location property is not necessarily the same qualities as a house that might get featured on Pinterest or in a shelter magazine. Remember, they are background locations, so they can’t overshadow the action, though of course the location gets chosen that helps tell the story. The most desired homes are within the “zone”—those located within a 30-mile radius from Columbus Circle. (Being outside the zone makes production costs higher due to union rules.) But, we do represent many homes outside the zone, as being in the zone is not a qualifier for every production. Brownstones with traditional details and mid-century modern furniture are always very popular. Also, modern farmhouses with painted white floors, simple furniture, and good light. What don’t location managers like? What should homeowners know before they list their home? Know that it’s intrusive and chaotic—at least in the first hours of a shoot day. If you’re someone who’s not comfortable with people being in your space, it’s not the right business for you. How much can a homeowner earn by renting their home as a location? Generally someone could earn about $3,000 per day for a print shoot, and between $5,000-$10,000 per day for a TV or movie shoot. That can go higher or lower based on the production budget and parameters. Some productions will even cover costs for a hotel or meals if you’ve been displaced for any length of time. One of the great benefits is that if you rent your house for no more than 14 days over the course of a year, that income is tax- free. Our most popular properties will see about 8-10 shoot days a year. How did you get started in the home location business? The inspiration came to me when I was on a run when I first moved in to my own Bedford neighborhood. As I was admiring all the gorgeous homes, I kept thinking, ‘This would make a great location; that would make a great location.’ By the time I got home, I decided to start my business. Being a former magazine editor and photographer’s wife, I already had a built-in client base! My role is similar to an actor’s agent. Location managers give me their specifications, and I provide links to homes that match the requests. If a production is interested in a home, we facilitate follow up scouting and booking. We’ll collect the fee and the certificate of insurance for the homeowners. We guide the homeowners through the process to make it easier for them and the production. Fees for our services are paid by productions, not by the homeowners. 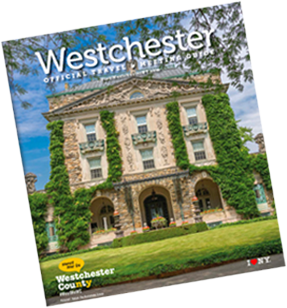 How can homeowners list their homes and how can location managers find a home in Westchester? We do everything through our website, www.arlocations.com. Homeowners can give us info about their homes along with photos. We can instantly tell if your home will work as a location. Location managers and photographers can also reach us through our website to initiate a search. For homeowners, we always say that it’s like the New York Lottery—you’ve got to be in it to win it. So, let’s put it out there and see what we happens! For 20+ years, Andrea Raisfeld Locations has been a resource for location managers, producers, photographers, and stylists, offering access to 1,000+ homes throughout Westchester, New York City, the Hamptons, the Catskills, and Santorini, Greece.